Although it's based on Intel's fastest new Ivy Bridge CPU for Ultrabooks, the Dell XPS 14 at 4.7 pounds hovers perilously close in weight to the all-purpose laptop category. But Dell gives you several reasons to lug the extra ounces around, especially if you value good multimedia features. Sitting in between the XPS 13 and the XPS 15 on the consumer-focused XPS laptop continuum, the XPS 14 we looked at boasts an exceptionally bright high-res (1600-by-900-pixel) 14-inch widescreen display and discrete nVidia GeForce GT 630M graphics with 1GB of memory to help with games and video. Waves MaxxAudio technology, meanwhile, contributes to the full-bodied audio from two built-in 2-watt stereo speakers, and the high-def (1.3-megapixel) webcam captures smooth video for Skype calls and YouTube clips. As an added bonus, battery life in our tests was a praiseworthy 7 hours, 37 minutes. But the XPS 14 disappoints in a couple of its features. The brilliant, LED-backlit display suffers from a somewhat narrow field of vision, especially when viewing videos from above or below. And the XPS 14 isn't inexpensive. Our review unit, which also included an Intel Core i7-35178u processor, a 5400-rpm 500GB hard drive with startup assistance from a 32GB mSATA solid-state caching drive, and the 64-bit version of Windows 7 Home Premium, goes for a somewhat pricey $1500. Dell does, however, offer less expensive configurations starting at $1100, as well as a version with a 512GB SSD for (gulp) $2000 (as of July 20, 2012). Performance, meanwhile, is a mixed bag that skews to generally good. 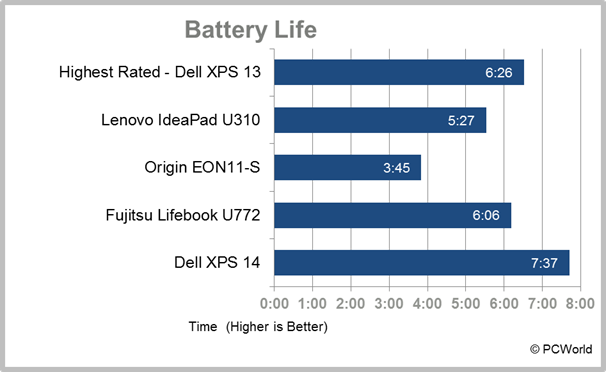 Although the excellent battery life helped lift our XPS 14's overall performance score to a respectable 79 (on a par with scores for the current ultraportable chart-toppers), the 5400-rpm hard drive did drag the XPS 14 down on some components of our WorldBench 7 benchmark, most notably hard-drive operations and video encoding. 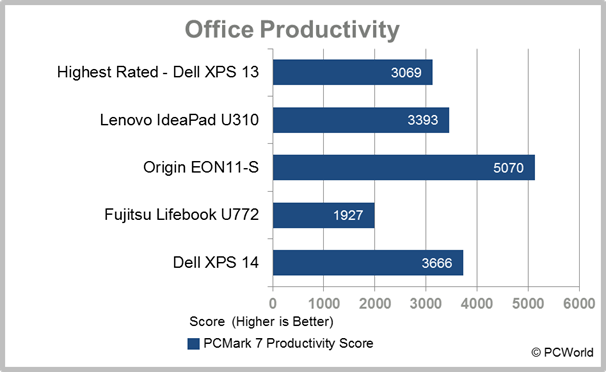 While the XPS 14's overall WorldBench score was a bit shy of recent averages, it had some bright spots, including an above-average score on the PCMark 7 Productivity Suite. Gaming results were also mixed--some slightly higher than average and others a bit below--but the overall gaming score of 84 out of 100 (slightly above recent averages) is certainly within the ballpark for a laptop with discrete graphics. The XPS 14 looks sturdy, yet at just under an inch thick, it is slimmer than you might expect for its weight. The pewter-colored, brushed-aluminum lid contrasts with the black soft-touch coating on the magnesium palm rest and the black silicon base (which absorbs a lot of the heat generated during prolonged use) to give the unit a layered look when shut. Bonded Corning Gorilla Glass covers the display, contributing to the model's generally classy appearance, but also contributes to the weight. Lifting the lid immediately reveals a roomy, backlit keyboard. The keys are fairly flat and a bit slippery, but travel is decent, and the conventional layout makes for a reasonably satisfying touch-typing experience. The clickable touchpad is responsive--and pretty much in line with what we've seen on a number of laptops lately. The XPS offers good connectivity options via ports arrayed on the left edge. From back to front, they include gigabit ethernet, HDMI, DisplayPort (for monitor connections), and two USB 3.0 ports, one of which has PowerShare technology for charging devices even when the notebook is powered down. On the right edge is a headphone/microphone combo port, an SD/MMC card reader, and a slot for a security cable. The XPS 14 also supports dual-band (2.4GHz/5GHz) Wi-Fi. Dell's software bundle is fairly typical, including the starter edition of Office 2010 (with ad-supported, limited-functionality versions of Word and Excel), Skype, Windows Live Essentials, and the annoying 30-day trial of McAfee Security Center (annoying because you have to uninstall it to stop the constant appearance of pop-up nag windows), as well as Dell-branded webcam and online backup software. On the whole, the XPS 14 has a lot to offer notebook users who can get past its weight and are willing to shell out a bit extra for its multimedia and gaming potential. Despite the great battery life, I'd recommend this one more for occasional travelers than frequent fliers. The Dell XPS 14 excels at multimedia, boasts great battery life, and performs decently--but it's heavy and a bit pricey.